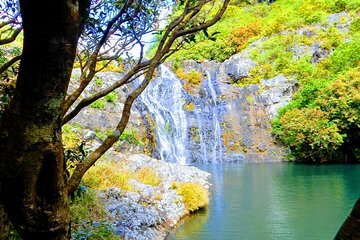 Choose between half-day and full-day options on this scenic hike through lush Tamarind Falls, renowned for its crystal-clear waterfalls. Take a refreshing dip in natural basins, learn about the area’s diverse flora and fauna, and enjoy panoramic views of the vast Mauritian jungles. Guided tours include tasty homemade local snacks and door-to-door hotel transfers. Your exact pickup time will depend on your hotel location, but will be between 7am and 8am. Please make sure you have provided the correct hotel details and let reception know that someone will be picking you up on the day of the excursion. Your exact pickup time will depend on your hotel location, but will be between 7am and 8am. Please make sure you have provided the correct hotel details.